I catch a lot of flack from people who notice the inbox total on my iPhone. Right now it reads 85,112. I kid you not. My one friend begins to twitch every time she sees the number increase. She can’t fathom how I function. To me, I’m not phased a bit. I still manage to receive all important messages, and you better believe I can readily retrieve any receipt, recipe or photo since 2010. My husband, on the other hand, has a mere 11 emails in his inbox. He religiously files all pertinent emails in his sub folders while trashing junk mail instantly. If his inbox list gets too long, he’ll reduce the text size to avoid heart palpitations caused by spillage onto another page. Some may say these tendencies are classic examples of Type A versus Type B personalities. Type A individuals are described as extroverted, organized, proactive, impatient and highly competitive, all traits inherent to my husband. Type B personalities are characterized as introverted, reflective, creative, tolerant, and work steadily for their goals, all qualities I tend to exude. Individually we may be polar opposites, but together we offset each other and make a solid team. These workers are the social bunch. They are friendly, inviting and loyal. Often times they are viewed as mentors or even parental figures. They focus on long-term development of the company and place a premium on teamwork, respect, and consensus. These workers are results driven and do things fast to gain a competitive edge. Leaders are demanding, hard-driving, and productive. They strive to win and are measured by achievement of goals and targets. These workers are highly structured. Rules and procedures govern their behavior. They strive for efficiency by maintaining a smooth-running organization. Success is measured by dependable delivery, scheduling, and low cost. These workers are innovators and risk-takers. They strive to be on the leading edge. Experimentation is praised and failure is expected. Success is achieved by developing unique products and services and acquiring new resource for growth. Creating environments that allow all workstyles to adequately work and function together is vital for any organization. Most organizations will identify with all culture types, but typically there is one quadrant that dominates. For example, McDonald’s Corporation favors the Control values. Their hierarchical culture is constituted by standardization and efficiency where every procedure has a particular rule and regulation of how it should be carried out. But recently McDonald’s experienced a tremendous slump in sales. To combat their recession, leaders leaned on the opposite culture type to breathe life into their stale identity. Innovation became the goal as Creators refreshed their aging brand to a more upscale, comfortable experience. Various design styles including Craft, Living Room and Simply Modern were created for this dramatic makeover. The expectation is the new design effort will increase sales 6% - 7%. So how can workplace design support various cultures and personalities? Since each type has its unique behaviors, values, and attitudes it is understandable that each culture should have its own spatial design when it comes to workspaces. Creators thrive on innovation and collaboration. Implementing workstations with lower panels for connectivity adjacent to casual group spaces decked with writeable surfaces and pin-up space for brainstorming is ideal. That’s not the case for Controllers. These workers require higher concentration and may benefit from higher panel workstations oriented in a rigid layout neighboring enclosed, formal spaces for structured meetings. 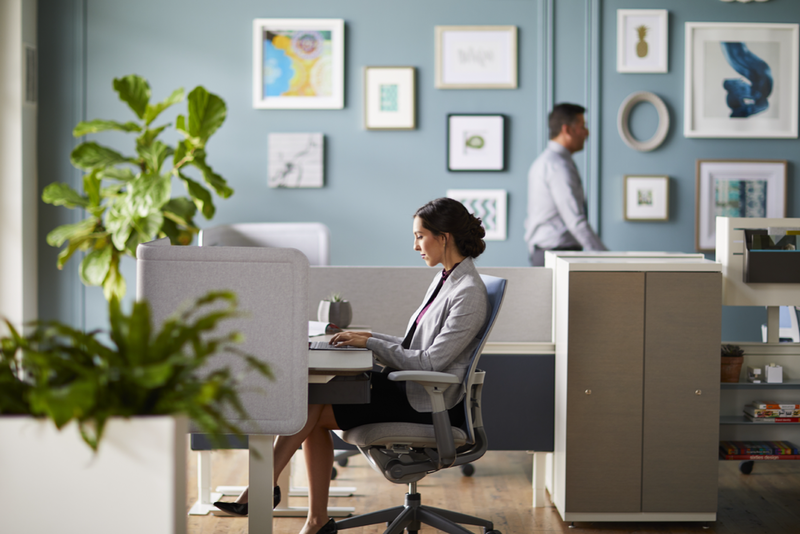 Haworth Compose Connections offers a wide range of configurations allowing users to design spaces for more focus or open collaborative work. This notion of spatial design and how it reflects culture was clearly demonstrated early in my career when I became a designer for….. you got it, McDonalds Corporation in Oakbrook, IL. My job was to create workplace standards for the campus. I quickly learned the title and role of many employees which dictated the size office or workstation deemed to them. The open plan environment was a vast landscape of rigid cubicles. Employees were sequestered behind tall panels or enclosed offices making connectivity obsolete. Open collaboration was non-existent. Meeting spaces were traditional tables and chairs behind closed doors. Pantries were the one source of vitality, so long as workers tolerated the red and yellow decor permeating their break areas. Structure, uniformity, and focus were drivers for design. Today, McDonald’s HQ is preparing for a move. Construction is underway for their new home in the West Loop section of downtown Chicago where Harpo Studios, home of the Oprah Winfrey show, once resided. I have to say I’m very curious what the new digs will yield. Will their space heavily reflect their control culture with little departure from the environment I’m familiar, or will it support a range of personalities offering variety to the way people do work? My inclination is the latter. As a workplace strategist, my job is to help customers diagnose their organizational culture and leverage spatial design to reinforce their unique fingerprint. Contrasting personalities may cause tension, but when recognized and supported properly this pressure becomes the bedrock for balance and stimulation in the organization. Having a workplace that enables the four cultures to work independently or together as needed is the key to effective design. I challenge you to think about your personality type and how it applies to your workspace. Does it support or oppose the way you do work? How would you change it?